The East End Action Group has been able to regroup following a significant loss of land at the proposed riverfront park site during the flood. 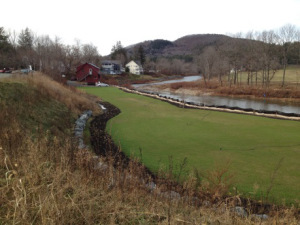 Before Irene, Sustainable Woodstock’s East End Action Group built community support, raised funds, and developed plans for this park. While Irene changed the project’s scope, the concept remains, and scaled back plans are re-focused on restoring the health of the river. The project has been endorsed by eight Woodstock civic organizations, and the Village Trustees have officially designated the land as a park. In Fall 2012, the East End action group hosted two “Jungle Tour” site visits, a community information meeting, and a “Green Up Day” to plant the riverbank. Another community work/information event was held in Fall, 2013. By October, 2014, enough progress had been made to hold a “Farewell to the Jungle” celebration. All these events elicited broad public support and involvement. 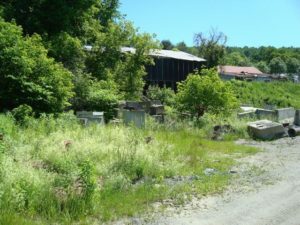 The proposed project will measurably increase water quality in the Ottauquechee River; rehabilitate a badly deteriorated parcel of prime riverside land; restore an area seriously damaged by Irene and protect downstream properties; offer post-Irene educational opportunities; and create a valuable recreational facility for town residents and visitors alike. Other portions of this underutilized site will be developed for public parking and reserved for commercial development. The East End project will remove an eyesore at one of the town’s major gateways, provide public recreation, and support the growth of local business enterprise. It’s a win-win situation for the community and the environment! For more information about the project or Community Day contact Sustainable Woodstock at 457-2911 or email eastend@sustainablewoodstock.org.